Upstate New York felt the impact of a massive nor’easter that ripped through Rochester on Wednesday. There was a fair amount of snow brought on by the storm, but the real damage was caused by the winds that got up to 35 mph. The freezing temperatures also created icy roads that posed a real hazard to drivers. The traffic conditions became incredibly dangerous because of the constantly changing weather conditions. Many cars were literally sliding off the highways in Rochester. Officials were advising people to stay off the roads as much as possible while the ice was still a factor. However, in order to keep drivers safe, the speed limit was lowered to 45 mph due to the multiple accidents on Interstate 87 and Interstate 95. The wind conditions were posing a threat to many homes and buildings in Rochester. Powerful gusts blew off the roof of a condominium building, blowing debris onto parked cars and homes nearby. Since Rochester is prone to experiencing nor’easters, it is necessary to take precautions before they hit. There are steps home and business owners can take to protect themselves from the damaging effects of wind. This nor’easter in Rochester created slick road conditions due to the icy that was formed during the blizzard. Even though it is recommended to not drive during the storm, sometimes it is unavoidable. In order to stay safe, there are some steps you can take to avoid accidents while driving during a nor’easter. Never get behind a wheel if you feel tired, especially during a snowstorm. You want to be as alert as possible when there are snow and ice on the road. It takes much longer to slow down on icy roads. Accelerate and decelerate slowly in order to regain traction and avoid sliding. Increase your following distance to eight to ten seconds. This will help you keep a safe margin between you and other cars. Be aware of your breaks. Threshold breaking is the best way to stop, so always apply firm, steady pressure when you need to stop. It can be difficult to begin moving from a full stop on ice, so if you can, keep rolling slowly instead of coming to a full stop at traffic lights. If you need to go uphill do not apply extra gas, this will only make your wheels spin more. Speed up a little before you go up the hill and let that inertia carry you up. If you are going up an icy hill do not stop your car, because it is very hard to gain traction to get going again. Remember, the best way to stay safe on the roads is by not driving on them at all. If you can, stay home during the storm. Even if you are a safe driver, you still have to worry about other drivers who are not experienced driving in icy road conditions. The storm that ripped through Rochester created powerful winds that damaged homes and buildings throughout the area. 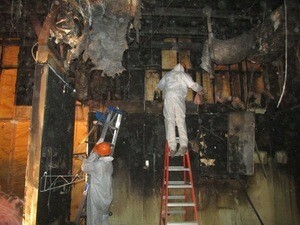 If you are a property owner you are going to want to protect your home from the damaging effects of a nor’easter. The first thing you should do is secure any objects that live on your lawn or outside of your home, such as patio furniture, bbq equipment, potted plants and children’s toys. If you do not have storm shutters on your windows, you can board up windows and doors in order to prevent breakage. This can happen by loose debris crashing into them or the winds themselves causing damage. When you are in your home during the storm, try to stay away from the windows in case an accident does occur that causes the glass to break. If someone does get hurt, you are going to want to have a first aid kit handy and in a place that everyone is aware of. Watch the local weather reports and stay aware of updates regarding the weather. 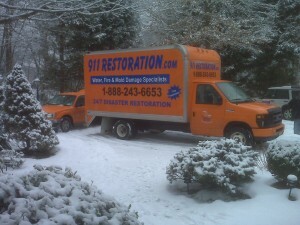 If you do acquire any wind damage in your home during the nor’easter you can call 911 Restoration of Rochester. Their staff members are available around the clock to assist you with anything you may need during this time.